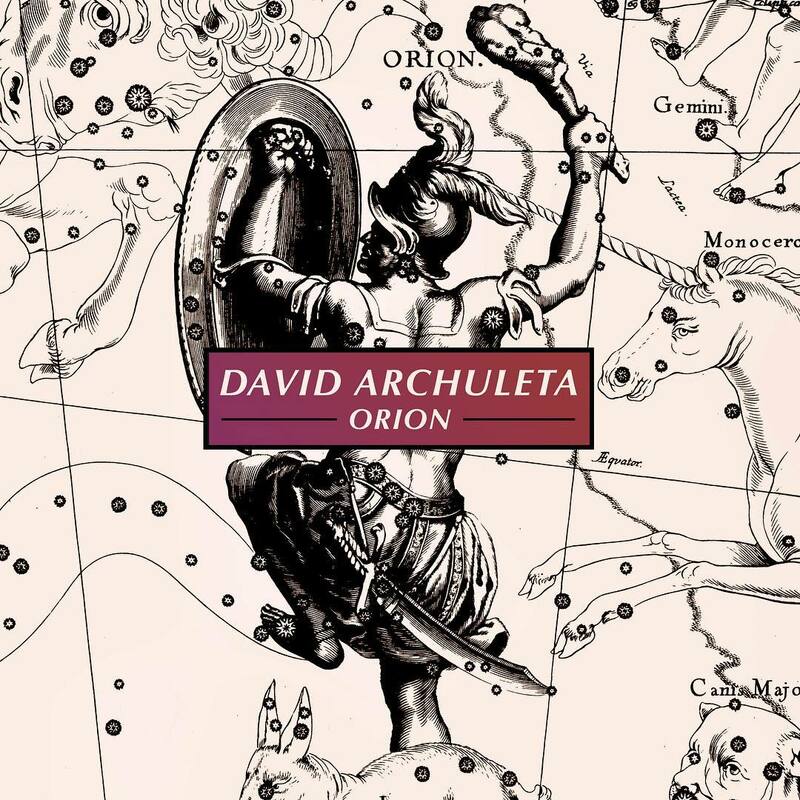 This entry was posted on Saturday, April 28, 2012 at 10:58 AM	and is filed under David Archuleta, Nandito Ako, vlog. 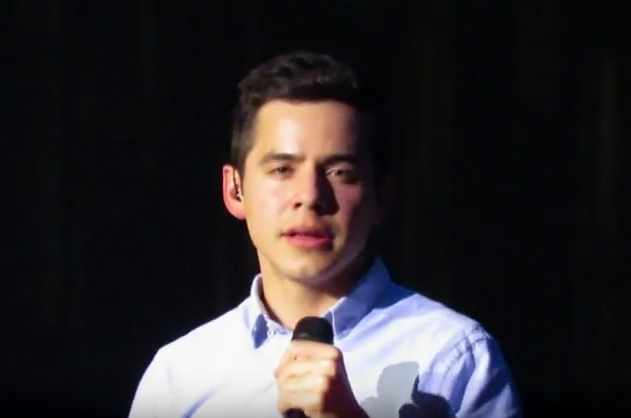 Tagged: David Archuleta, we got vlogged!!. You can follow any responses to this entry through the RSS 2.0 feed. You can leave a response, or trackback from your own site. Thank you David for taking the time to send the lov,e one month to the day, you left for your mission. What great fun! Spending time with David backstage. I love the finale, where the rooster crows. Gotta go back and see that again. David is waiting. Can’t wait to see the month of April disappear from the side bar. Thanks for posting the video! I know it’s probably just makeup, but David looks like he’s blushing! haha Awww … And I like how he’s so careful not to wake the guy sleeping on the table. Nice screamcaps, too. I like the look on his face in the fist one. Wonder who he’s looking at? Hey y’all, it’s been awhile since the last time I commented on here!! It was an unexpected video, now, I think, there may be more videos hidden that will be showed little by little. He looked great and what a treat to hear him say again, “Hey guys, it’s David”. I have a feeling one day when he gets a place of his own…. there WILL be chickens. haha. Have a great Saturday everyone. I’m off to seize the day! See ya in Unplugged tonight! drive thru:)) I’ll have a strawberry shake, please. Abrra…finally out of the sevens and into the 6′s. nice to see that today. all these beautiful photos…so awesome. they all just leave me staring, and sighing…and smiling. A new vlog–what a sweet surprise! He’s awfully good to us, but what’s with the chicken fixation? Nothing with a brain the size of a peanut makes a decent pet. Do you suppose he looks at a chicken and thinks, “Hmmm, arroz con pollo!” ? I think its from his childhood. You know how he loves his family? His grandmother had chickens when he lived in Florida. I bet it reminds him of good times. You can hear rooster crowing throughout Nadito Ako when they are in Anya’s neighborhood. Arroz con pollo means “Rice with Chicken” in Spanish. It is a classic dish of Spain and Latin America, with many different traditional ways to prepare it, unique to various countries. An arroz con pollo you find in Cuba may be quite different than one you find in Peru. New fan video with a great message for David! That serene countenance. You feel it too, right? @kariontour aww kari i just saw your first bts vid! this is so bittersweet!!! i miss u both! Notice it says FIRST bts vid. First? haha So there are more to come!! Just came home from a funeral and I’m high on prednisone with swollen throat and esophogus, so——-WOW!!!! This is what I needed….what a great surprise to see David backstage! He’s thought of us again, does it really surprise us?? Looks like he has more up his sleeve! goody! goody! I love this guy! !>3 To me the chickens (roosters) are just a metaphor of David’s personality, as in a simple, easy life. That’s probably why he feels comfortable there. Elvis’ mom had chickens at Graceland too. Always loved the WFM merry-go-round and now the "take two" even more! Hope to be on unplugged tonight. The VBlog! What a treat for this hungry bird. 🙂 Aw…I miss him. PS. #11: Chest…and arms. Those arms look like they could crush concrete! The remind me of Mr. Clean. Ha ha! A vlog 🙂 A chicken vlog, no less. Feels good. Really good. bluesky, wanted to thank you for the wonderful article in the last thread – as beautiful and expressive as it’s subject. Dayzee, can see how when you remove your daily link it gives you a solitary moment to ponder…can’t think of a better way to end your day. Rainbow (one of my favs) had a few versions? Soooo, how about a harmless little leak of another (or all) version. Betsy, lol! You definitely came to the right place. And thanks for the video you posted awhile back – YEDL, you’ve been missed. Finally out of those blasted 700’s, thanks abs! Forgot to mention, love the pics by Arlu Gomez. 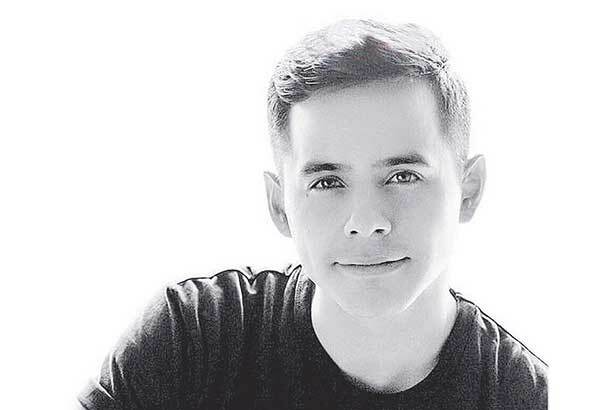 Wow, the list of his subjects – would say OPM got one of the best of the best for David. They certainly gave him the kind of respect he as earned, as an artist and a person. Gayle #14–LOL! I just spit out the nice wine I was sipping. Crusher FTW! 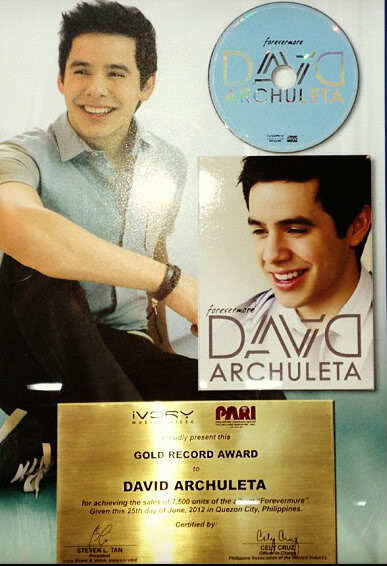 Grammyj found and posted this at SoulDavid. It is the complete recording of A Puro Dolor from Mentor’s Gala. Bless the person who posted this on tumblr and thanks to grammyj for the find, too! Hit the play button under the pretty picture…. Forgot to say, the above is worth the listen just for the glory note at the end–holy frijoles! While I was posting this on twitter, ShellyFOD asked me to make her nija videos of that night into mp3’s. Thanks for the mp3s Fairy Godmother! Jan11 That made my day ♥♥haha!! You go girl!! Yea, Heidijoy, you was standing right there! Coming to unplugged shortly? If so, “see” ya there! What a perfect gift for this Saturday that’s been full of nothing new from the real world! A mega-super vblog from David (well Kari), videos from yester-year, pictures to take your breath away, AND our fairy godmother has had her wand doing good things…thanks(♥♥) Abrra for the mp3’s. 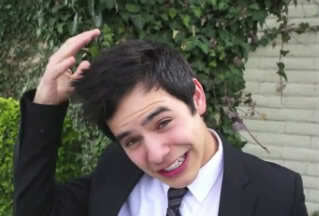 Loved David’s “backstage tour” of Nandito Ako chickens and all!! Miss him so much! Appreciate Kari for posting this & the weekly tweets! She is AMAZING & don’t know what we would have done without her! Abrra~thank you for the mp3s. Wanted to comment about Dream Sky High. That song was never a favorite of mine until David sang it at the Mentor’s Gala. 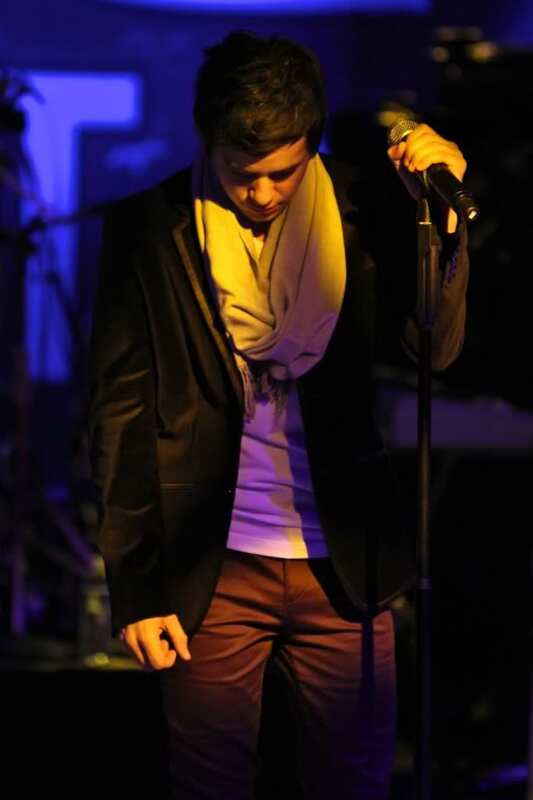 I know he has sung that song for many years but that night he was in full, passionate control. He just rocked it! I was mesmerized! I love to watch him sing it. Those new pics by Arlu Gomez are just outstanding. It is obvious he respects David so much. The shot of D on the floor in the blue shirt smiling directly at you is well…….just Gah!!!!! I’ve never gone to Unplugged but maybe I will one of these weeks. You all seem to have such a good time. If you were in Unplugged last night, you might remember the video where I got these scream caps. Nice screamcaps Abrra….eeek! I know, but I’m not tellin! Abrra, thanks for working so hard yesterday, those videos were so awesome!! ‘Contigo’ is back in my head today! #22 Jans11 I went back to look at 3:40 of the vlog – he really did that to you? You lucky duck!! That’s a great souvenir LOL! #15 Emmegirl14 I want all those other versions of Rainbow too. It’s my favorite from the album although Tell Me is now a strong contender for the top spot. Yep, Fenfen, he did. I felt it was his stamp of approval on what he was doing for his fans, that he was loving it! Even though it is an intangible thing, not like my pictures and posters, that it’s a great remembrance like our little chats are. I can bring them home and keep them all safe in the back of my mind. And when I think of any of them, it puts me in a happy place. To me, David is what is happy and good in my life. It never falters, ever! I don’t know why I was a “chosen one”, like all his fans that “get him”, to get to meet and enjoy this special person’s God given talent, but I’m so blessed! 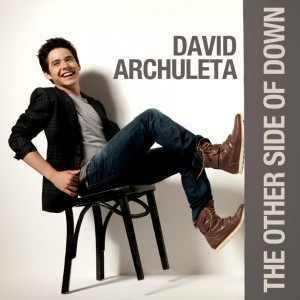 I play his music all the time and this new album blows my mind!♥ It is totally habit forming!! He is not my whole life, I have a wonderful family and job, so keep really busy. 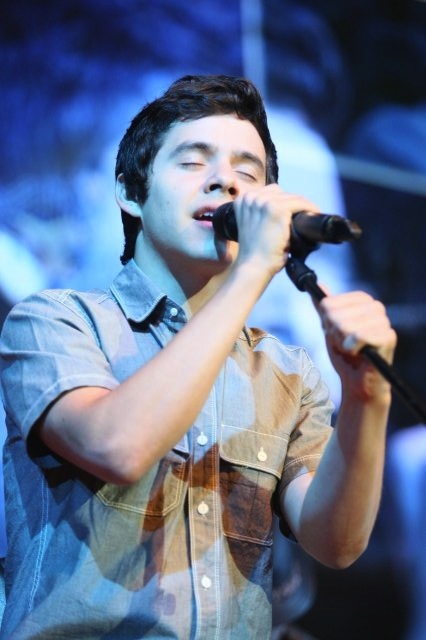 But, David is an extension of my life, my happy place, where I can go and just enjoy! Like coming here and talking to others that know what I’m talking about! Annmargaret or anyone else that hasn’t been to Unplugged you should check it out even though I missed it last night, I fell asleep! grrrrr lol Had a long day at the park with baseball games and lotsa a sun :). 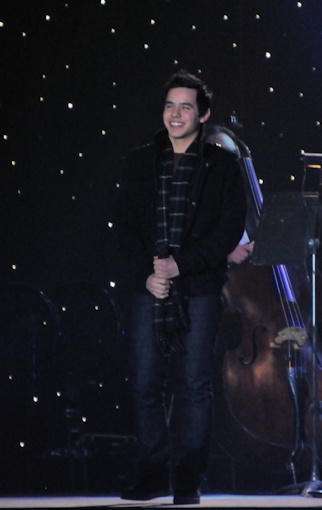 David Archuleta has a relationship with his fans and loves us for this I know haha. What a guy leaving us so much and who knows how much more is in store for us. I love his love a chickens. I grew up surrounded by red hens and roosters. My son raised a chick to a full grown hen. He carried it around like a baby and it followed him around like dog, even sleeping with him lol That was not a dumb hen haha. David sure knows how to hold a chicken as seen here. Last Friday night I was waiting in traffic when I saw two missionary boys crossing the street. I find I have a whole new attitude about the missionaries. I had the urge to get out of my car and run to give them a hug but, sanity prevailed. #28~I am guessing it was the MOTAB rehearsal. I love that grey sweater! DJA–Aww, I had no idea chickens would bond with people. My grandmother had chickens and so do several of my friends, but they must all be of the species gallus gallus dumb cluckus. David does know how to hold a chicken–it’s always fun to watch a city-boy try to grab a chicken-LOL! Djafan ~ thanks for the invite. I’m going to go soon. I was talking with a fellow fan today about missing David. I said I think he will stay in touch with us probably through Kari. What I hope we get is a picture every few months of him. Watching how he has matured the last four years has been fun. If we don’t get to see him for two years it would be sad that we didn’t get to see him change & get even more gorgeous! It’s still #1 for me. We took a long drive yesterday and I was finally able to play the cd in my car. Windows tightly shut as to keep every heavenly note inside. I heard sounds I’m unable to hear on my living room stereo nor on my ITunes, mostly background vocals but lovely. My husband liked it too! His favorite songs: “Rainbow” and “Reaching Out”. He had good things to say about the production and was surprised to hear it was made in a few days. He also thinks the piano player is very talented. Call me greedy but I wonder what other goodies David and Kari have hiding up their sleeves. You guys have so much fun, someday when I get my video to stream smoothly I’m grabbing my vino and skipping to chat with a big grin on my face. When I got my album I was eager to hear the songs I hadn’t heard and didn’t listen to the song Forevermore. This week, it’s on repeat, so so beautiful. Been trying to get the sound on the itunes download to match that of the album – finally set the equalizer to Vocal Booster…. amazing…..right where it should be. You are right about Sacramento.ding ding ding! ……”Windows tightly shut as to keep every heavenly note inside.” aww,love that! Forevermore is so pretty I repeat that one alot too! His voice is so gorgeous on each of these songs,but somehow Tell Me, still has me under its spell. At 1:31, See David do an imitation of a chicken! bebereader,thank for the PBS interview video, so good. I forget sometimes how charming David is… pure love. 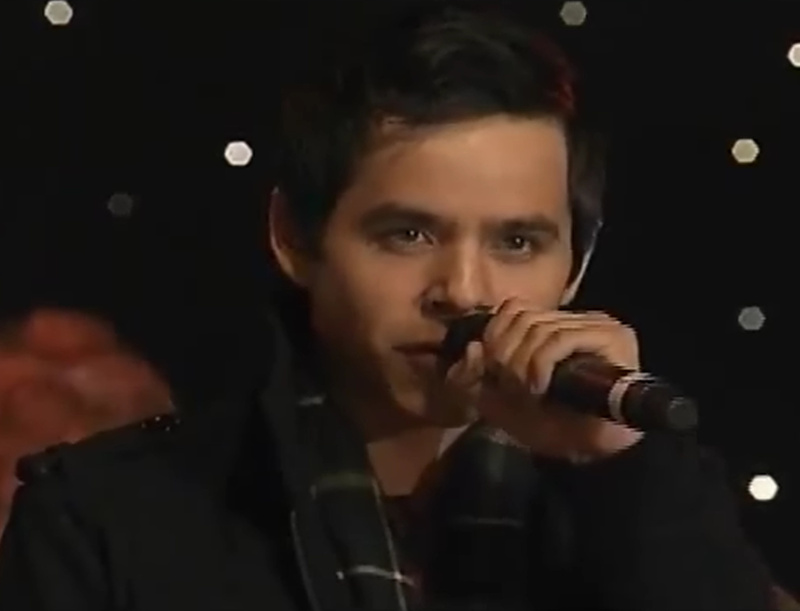 That was from a video taken in Sacramento at the tree lighting ceremony. It was about a week before he sang at MOTAB in 2010. Love the NEW collage that Djafan posted at the top of the article! Hi everyone! Just back from a weekend spent scrapbooking! Great fun but missed the chat on Saturday night! Love “talking” to you guys! Bebe,I do love that PBS interview! haha so cute. I get so excited to see any new picture of him that once again it took me “a second” to find him,even though he is on the end, right there! I think it’s because I go right to the middle. Habit, as David has usually been smack-dab in the middle of any group picture, for the past 4 years! the young man sitting front and center and making the ‘face’….something tells me he is the one in the background of the second pic jumping up, with a flashlight? :)) ya think? Really nice screen cap collage Djafan, quite the handsome subject! The one of David and the “pet rooster” comes in a close second of course. It’s hard not to draw a heart! bebe, thanks for the interview/chicken impression. Watched Silent Night (beautiful) and that killer PataPan. He was so good that night. You’re very welcome, Emmegirl! One thing leads to another on youtube and we’re entertained for hours! So excited about the month of “April” coming off the right sidebar. It doesn’t take much to make this fanbase happy! I just want to say I had really respected your decision to respect David’s privacy while he is on his mission. I know there was a policy to not post missionary blogs but lately I have been noticing a ton of pictures posted of David from missionary blogs. What happened to the previous policy? “Windows tightly shut as to keep every heavenly note inside.” What a lovely way to put it. ♥ and I agree. We don’t want a single beautiful note to get away. As you can see, it was about protecting the privacy of the bloggers. Links to family blogs meant as a form of personal communication, do not belong on fan sites. As far as pictures of David, he poses with groups in public places. It would be the same as when he sang in the MTC choir and it was broadcast over the internet. We did not allow any pictures taken by his family on the day he left. There were some that originated from a family Facebook owned by his aunt. Those pictures are what we did not think belonged on a fan site. They made it to twitter and to some fan sites.Subsequently, there was an article in a Latino blog that interviewed David’s grandfather who allowed the Facebook pictures to be used for that article. I do not believe that any of the pictures we have posted have invaded his privacy or his service in South America. True, David is posing in pictures but he is taking pictures with other missionaries while he is on his mission. He is also aware the pictures are being taken but that does not mean that he is aware that they are being spread around the internet on fan sites. I take pictures with family members and friends but that does not mean that I want them to be spread around on the internet. I take pictures to remember a special occassion not share it with people I don’t know. And it is not as if he is taking these pictures with fans and so therefore he expects that they might be spread around. These pictures are being taken while David is on a personal journey. A journey that he told us that he would be taking alone. He asked us to respect this. Also, Kari just thanked someone on twitter for tweeting this: By RTing or posting anything abt David’s Mission that was not sent by him or @kariontour you are going against what David has asked of us! Kari is a representative of David and I would think she knows David’s wishes. I can’t change what anyone will do. I just wanted to ask what had changed. Thank you for your reply. Thank you Kris for your follow up comment. I respect your concerns about what is posted. I had not seen the tweet from Kari. That she is David’s “voice” regarding his career while he is away, gives what she says some validity. Ido not think we are invading Davids privacy ! Im sure David knows if he posses for pitchers they will be on the fan sites !If people were sneaking around taking pictures or trying to find out what he is doing then that is invading his privacy! other than that i dont see any thing wrong !!! Hello, quiet night tonight. Is it because of the the comment by Kris? Abrra answered what we the adms with Angelica’s leadership decided to respectfully do on The Voice, thank you Abrra. I have a lot of opinions on this subject but I’m more curious to know what the readers of The Voice think. Thank you Kris and Loulou for your comments. 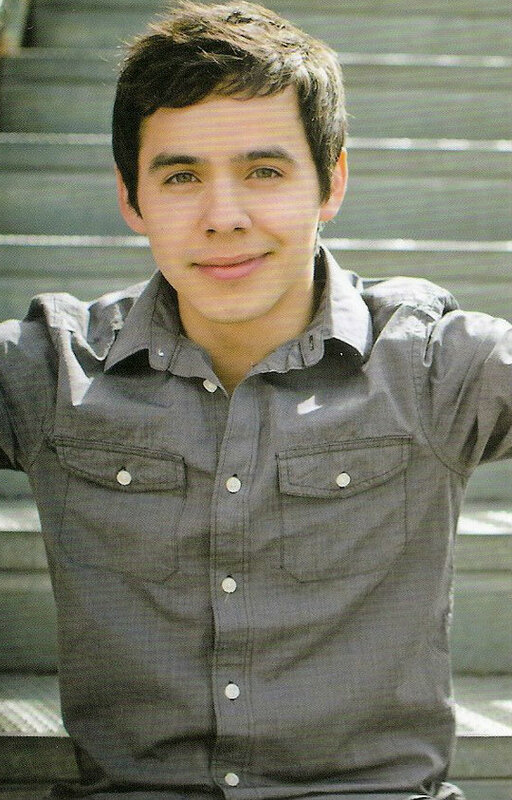 David Archuleta has a pretty crazy wish list. Swimming with sharks? Skydiving? Is he nuts?! I guess I’ll be the first to comment. LIke you I have lots of opinions, but I think it boils down to this. I think Angelica’s balance is just right. Respecting by not linking blog posts here or copying their content, but I don’t see how the occaasional photo hurts as long as they are innocuous photos and do not showing him actually performing missionary duties and are not photos taken without his knowledge. I think it would be kind of odd to have two years pass without a current photo. JMO But I am perfectly happy with whatever way the admins here work it out. I trust their judgement. If they post, I will look. If they don’t, then I won’t. Simple as that. I’m with MT. I feel if David is posing with his companion or a group of people, we are not invading. If he is caught in candid shots, we are invading, regardless of what he is doing. He understands where we all are in needing/wanting to see photos of him. I don’t want to go against what Kari has said, and I don’t think we have. But, like has been stated, it’s a fine line and I appreciate how the Admins. are walking that line. If every picture is required to go thru approval of the admins before being posted, I think we can all rest easy. If something ever needs to be taken down, you can bet your bottom bippy that they will do it. I appreciate and respect your guys’ position on the whole blog issue. I don’t think it’s the content of them (letters and pictures) so much that matters, as I do the links to personal info about the individual missionaries. Just gotta say………I may not comment here often, but I LOVE this site! I agree with Abrra, “I do not believe that any of the pictures we have posted have invaded his privacy or his service in South America”. I have the utmost respect for David’s privacy and I don’t think looking at an occasional picture that David posed for, taken by another Elder is being unrespectful. I always thought his fans have been very respectful towards David, that is what I loved about going to concerts and meeting his fans. Everyone has been so nice. So far, I haven’t seen any any unposed photos that he didn’t know he was in, that would be invading his privacy and being disrespectful. I also do not see anything wrong with the countdown or countup or marking off the days on the calendar, or wearing bracelets until he gets home, either. To me it is showing David respect that we are “holding down the fort” until he returns. On the lighter side, when at work today. I was playing my Evermore cd(of course) it was playing one of the last “minus one” song, when a little gal hobbled in with her walker and sat down. She says “well are you playing that enchilada music”? 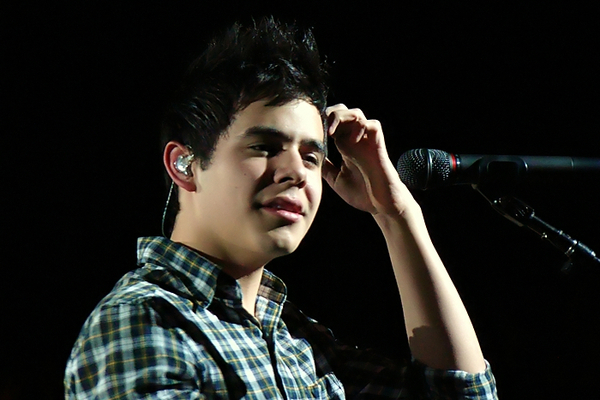 I laughed and said “it’s Archuleta, and yes, that’s what’s on now”. She said, “well, whatever his name, I like it”! Been surfing the other sites and one David FB site this evening and 4 long-time, dedicated, respectful fans have said they are leaving David for good. One beautiful soul I have known for years and met at concerts. Not because of his mission, but because they feel they are being judged as disrespectful. Sad. I made the decision to not post blogs of missionaries because I feel these are unguarded letters that leave them open to criticism by David’s very protective fan base. I don’t blame anyone for reading them, just don’t want them posted and discussed on this site. I am not anyone’s judge, nor is David. He wants respect on his mission. He doesn’t want to be stalked; he doesn’t want to be hounded by fans. In short, he doesn’t want anything done by his fans that could get in the way of his completing his mission. Taking photos of him in the act of performing his duties as an ambassador of Jesus Christ, in the execution of that mission would fall into that category. Group photos he poses for with other missionaries in his down time are another thing. I can not see the harm in it. These photos of David posing as one of this group are important memorabilia that should be treasured. Everything that you have written Angelica should be easily understood. To stop the pictures of groups of guys and girls who have gathered together to help people would be as difficult and unreal as stopping the water from flowing over Niagara Falls. You would have to close down Google Images and also YouTube which are wide open to viewers. I am honest in saying that surviving total separation from someone who shared life’s daily occurrences and dreams will be more difficult than we know yet. But, forget the scolding from outside because we are doing the best we can and we deserve some of that respect that is going around. I know that there are limits to everything..
Dang the little rascal morning birds are telling me it is too late to sleep. I was awakened by a dream about David and no one was laughing. Ah! Such a beautiful morning here in Massachusetts. Nature’s rain has cleansed the earth as I slept! SB’s chirping birds flew south to awaken me as well. Thank you to all who have shown support for David through all the years. We have shared many times of “David-drought”. It’s times like now that we need each other more than ever. One of the reasons for Unplugged is to have a place for fans to meet up in real time, but never have to leave the house. 🙂 I am always thrilled when we have a new face come in and share the fun. I will be holding a “Special edition” chat tonight at 9PM edt in Unplugged for all fans to drop in for a visit. You don’t need a password.The first time you come to the site, just start typing in the chat box and when you hit enter a box will pop up asking for a name. Type any name you wish and hit enter. You are chatting! Below the chat line is a B. Click that once to bold your text so we can read it easily. You can even dress up your name with a color! The small black square below the chat box is a color picker. Click to choose your “dress”. We have some handsome wallpaper too! In case you have never seen the site, here is a screen cap. One of the “new” videos I recently added to Unplugged. It’s getting back to the good times! “Best Wishes” Betsy on your very own day! what a be-uuuuu-tiful cake! (sure looks yummy) Hope your day is just as sweet! Abrra, love the “Crush Montage video” I like all those Davids singing to me at once:)) ,closest thing we have to cloning him, which would be my preference. Thank you for your insightful comment, and for sharing your heartwarming experiences with us. LOL about the apple pie! I know that I can’t control what other fans do. I can only control myself. I do like to give my opinion though. I personally think goggling to find any mention of David and posting info and pics of David on his mission is going against his wishes. I have thought that ever since David ‘s vlog when he told us that this was a journey we would not be taking together. This was not something that he would be sharing with us. I feel that even more now that kari has agreed that posting things from his mission that did not come from him or kari is going against what he asked of us. David through kari will share what he wants us to know. I also want to say that i disagree that just because someone poses for a picture that means it is a picture that they want everyone to see. I realize my opinion doesn’t change anything. I just wanted to give it. My boys can do the laundry. Angelica – EVERYONE should read your comment. Nothing but respect there. I am in total agreement. Happy birthday Betsy, enjoy your special day. Thanks Cq. 🙂 I totally am. Angelica, I really hope to meet you one day so I can tell you in person how much I admire your great, good sense. Plus, I would love to know if you look anything like the mental image I have of you-ha! It’s a beautiful one, don’t worry! I have little to no interest in the missionary blogs, and I don’t see how posting a posed picture, which is already in the public domain, is disrespectful. I do not visit all of David’s fansites, but it seems that at this point in time, most have formulated and clearly stated their policies as to what they will or will not be posting, just as the admins here have done. The sites I visit seem to be adhering to those policies. Truthfully, I think this whole situation has been blown out of proportion, because I have only noticed references to a handful of blogs and 3-4(?) pictures. Mercifully, I do not do twitter, so I am out of the loop as to what info is passed around there, but the fansites have been very restrained in what they post. What is posted is done so in the comments, which further restricts dissemination of the information. I do believe it is time for the self-appointed fan police to recognize that they are now probably doing more harm than good by continuing to stir the pot, and are only succeeding in weakening the fan base. Very sad, indeed. I hope these fans decide they will not be chased away from something as worthwhile as supporting David and his music. “These photos of David posing as one of this group are important memorabilia that should be treasured.” — Indeed! Hope we continue to see such treasures over the next several months. Love to see a well and happy David. Abrra — perfect timing for a ‘special’ Unplugged tonight. Love to share chat and laughs, and more laughs, with David’s fans — maybe new chatters will show up — therapy, therapy! Love David, miss David. Betsy — have a wonderful day and a great year to come! I waved my wand and your wish is my command! I was given permission to share this photo sent to me by Angelica. Thank you all for giving us your thoughts on the “respect” issue. Thank you Angelica for your words ♥ I’m in complete agreement with the stand we’ve taken on The Voice. I’m an input junkie. 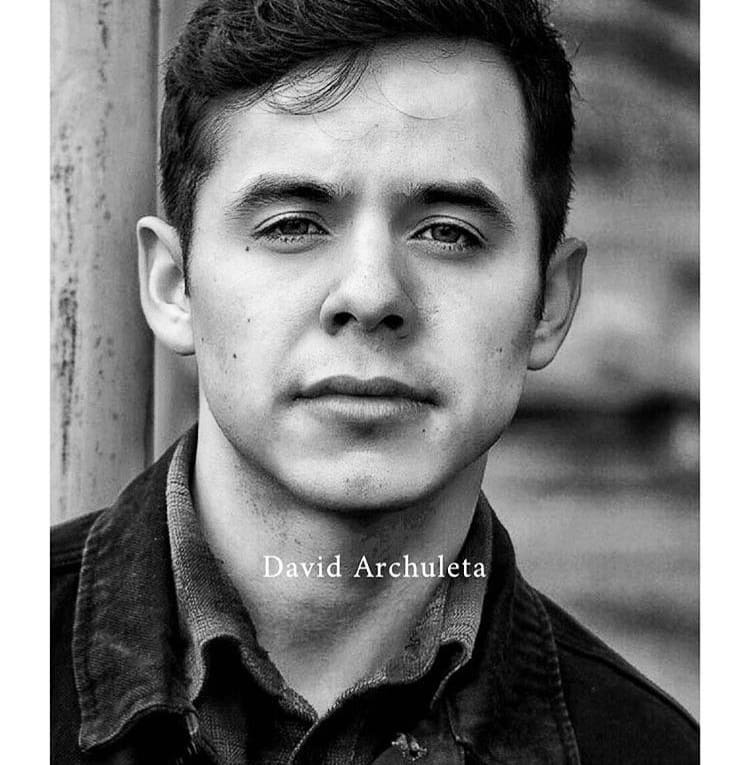 Books, TV, movies, news, history, current events, religion (and not just since David), politics, economy, technology, music and as of 4 years ago music by David Archuleta which evolved to anything David Archuleta. I’ve read COS 5 times and will ready it several more I’m sure. So for me it’s natural to read the blogs by the Elders and welcome the smile and joy I feel when I seen David in the pictures they post. Some say that David doesn’t want us to because of his It’s Not Goodbye vlog and that’s fine, I understand and respect them but I don’t agree, it’s not my interpretation. But I don’t believe it’s my place to change anyone’s mind and tell them they’re wrong, that they should read the blogs and look at the pictures. I’ve read many comments of people saying they’re done being a David fan because of those telling the fans what they should and shouldn’t do. I hope they reconsider because the one thing I’m sure of is that David, his team, his church and us didn’t and don’t know how his mission experience is all going to play out. Having said that I think David is going to be fine and will make the necessary adjustments as things happen. I’m sure he didn’t expect to be such a celebrity at the MTC 🙂 His church has made adjustments as they go and will continue to do so. I think we as fans should do the same. This is unknown territory with a lot of gray area and room for all of us IMO. I also want to give out a shout out to the Chile fans. There was a twitter freakout by the Bieber, Jobros and Demi fans in South America when they found out Sunday that David is in Chile, it was interesting to watch. Complete spazzing to the point where some started rallying up a group to go find him. The Chile fans intervened and were able to bring calm. They’re doing a great job! In the midst of all this David buzz continues on the net media and twitter followers keep increasing. A passing thought,,,, they seemed to pass quickly lately. I love David. He is all that I want to be when I grow up, and yet he has helped me figure out, I am grown up and I am okay just the way I am. Hi acceptance of others and himself have helped me “let go” of trying to make myself someone I am not or expecting others to be someone they are not. I hope everyone feels they can speak up about how they feel on the mission “pictures” issue, and then let it go. Do what you think is best for yourself, because that is all you can know,, what feels right for you. #80 Wooot!! I was right. Blond, beautiful, and a big smile. I didn’t envision the red hat though-ha! I love it! Thanks, Abrra! Oh, and I do have a twitter account with which I follow precisely one person, but I have never tweeted. Not seeing pics of David for two years is too much to bear. 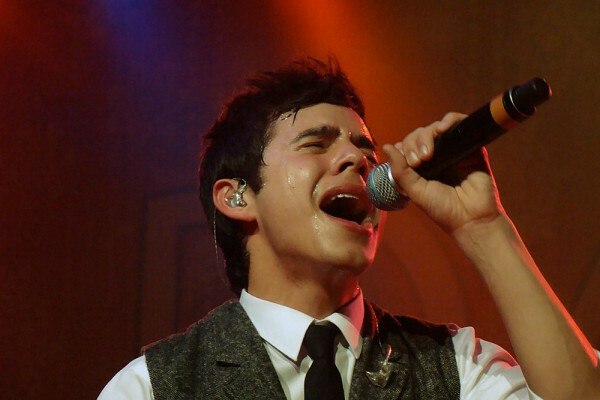 The Voice is a fansite for David Archuleta and his fans. People visit here each day to catch up on what he’s doing and that includes newsworthy items and photos. Fans, by their very nature need to see photos of and catch up on their ‘celebrity of choice’. As long as the photos that cross our computer desks are respectful of David, there will be no problem posting them here. That’s always been our policy and it’s not changing. We’re all missing him so much already. 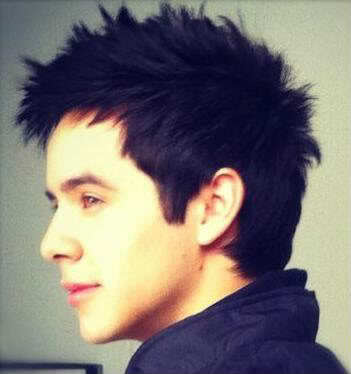 I’ve never heard of a celebrity who is more loved by his fans than David. B-e-t-s-y, Haaaappy Birthday! Glad to hear you are gifting yourself with a well-deserved glooooriouuus day! Wishing you all that you love on your special day! Thank you to all the admins for their care in the management of this site. Dang that was a craaazy good bluesy version, Dja! Muchas gracias! I am knee deep in a cheesecake sampler at the moment. My son gave me two cakes, one of them is a giant platter of cheesecake samples. Currently trying the turtle one. Omg. Betsy, wishing you a very Happy Birthday! Betsy ~ Happy Birthday and may all your dreams come true! djafan ~ so glad you put the best ever happy birthday song up. I tried but my “smart” phone wouldn’t let me. There are still matters to be cleared up for the fans. My husband said hurry and get the bracelets out because some may not want them anymore!!! I think he was half serious. Hope you have a Happy Happy Birthday with lots of cake & ice cream and family & friends! May it be all that you want it to be. Sounds like it’s off to a good start. And Yayyyyy, April is gone from the sidebar!! HAPPY BIRTHDAY BETSY!!! All the best 4 u on this special day! Too much drama in David fandom…lol. Me.. I just wanna look at whatever David pics are posted to see his gorgeous, happy face and listen to his amazing voice everyday for the next 696 days..then I’m good. Thanks archiesfan4life, annmargaret and MT! Dr. Abrra’s prescription for what ails ya ! Happy Birthday to Betsy! Hope you are planning to share that cake at chat tonight. Thanks Lani, and I agree wholeheartedly with your sentence #2! Also, I loved your comment, Dja. I have been reading the old back threads over at idolforum. I never really read them back then – I started way late. There are almost 170 pages of just David, with over 40 threads on each page. With tons of stories and comments on many of those threads. What a joy most of it is to read! 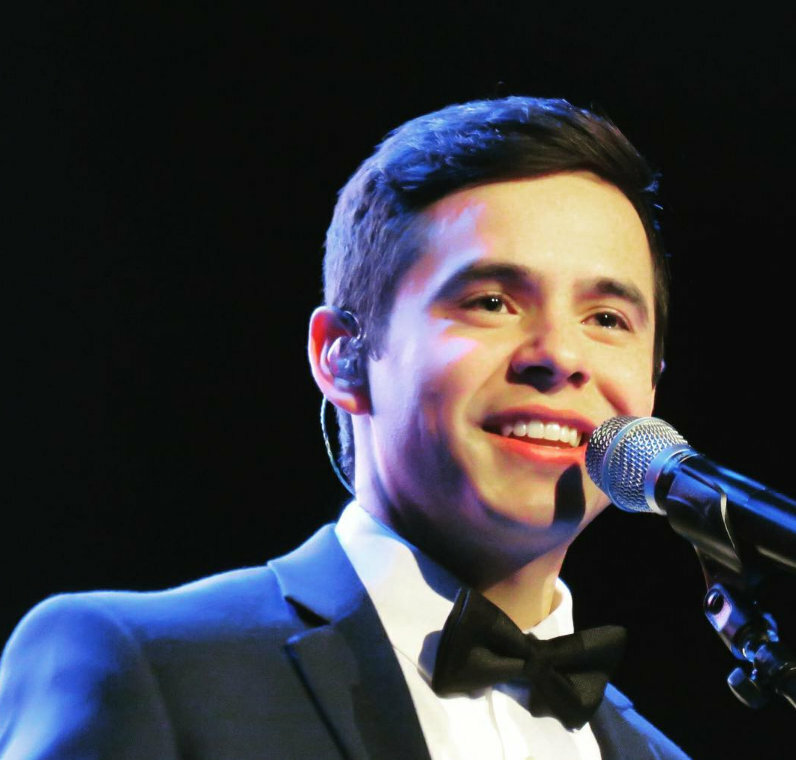 Stories of meeting David during the idol tour are amazing, there are so many! Hundreds of recaps, pictures, videos, polls, funny and beautiful stories about David interacting with fans (afterparties, busses) on a large scale for the first time. 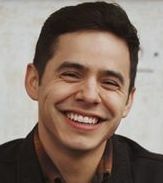 About the songs he sang, about some of the antics the idols were up to, David’s random singing while signing autographs, the recaps of a few people who actually tried out for David’s Crush video – this is a goldmine. Can I say gorgeous again? And mesmerizing? I will be holding a “Special edition” chat tonight at 9PM edt in Unplugged for all fans to drop in for a visit. You don’t need a password. The first time you come to the site, just start typing in the chat box and when you hit enter a box will pop up asking for a name. Type any name you wish and hit enter. You are chatting! Below the chat line is a B. Click that once to bold your text so we can read it easily. You can even dress up your name with a color! The small black square below the chat box is a color picker. Click to choose your “dress”. We have some handsome wallpaper too! Abrra, everything that is posted on this site has been usually posted somewhere else first. The reason all of you post from all other sites to here is simply for convenience for those who frequent this site. We all contribute to the site freely. I was teasing you. You can bring over what you like. Can I just say one more thing? Ken Jennings also wished me a Happy Birthday on Twitter. @betsyjane25 HAPPY BIRTHDAY! YOU HAVE THE SAME BIRTHDAY AS JESSICA SIMPSON’S BABY FOREVER!!! 107. Betsy — again, congrats on your b-day and super congrats on the Ken Jennings tweet. Did anyone give you a copy of ‘Brainiac’? Betsy! that was so nice. I am sure you will always think of Jessica’s baby every birthday. haha! Ken is funny! Ray, don’t go. You are stronger than that. I know because I’ve read your story. ♥ It’s only been one month and everyone is going through a period of adjustment, including David. It will all work out. Have faith! Angelica, think you hit the nail on the head. One down, 23 mos to go, the reality is setting in. For me, the folks at the couple of sites in which I dwell are what I am counting on to get me through. Betsy! What a special day for you! May you have many more fabulous birthdays! Just thankful to David for the joy that he brings to our lives. He is worth waiting for. Voting & twittering as possible … every little bit helps. 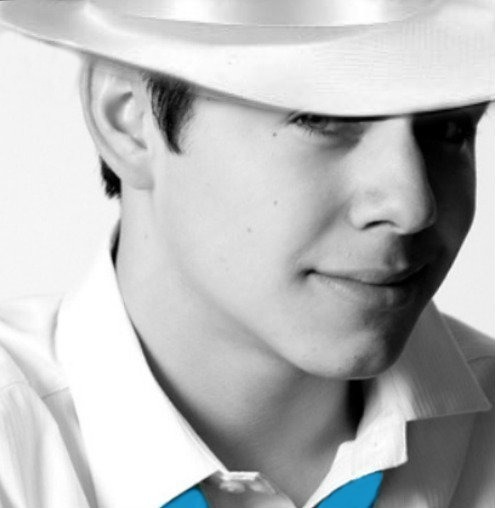 Thanks, Angelica for the clarification, and the re-release of your red-hat photo (I love it!). Ray, hang in there, it will get easier, and the time will start to fly by. There are a couple of missionaries in my ward (parish) here in Utah that are due home in a couple of months, and it seems like they just left. We’re all stumbling all over ourselves with wondering what to do and how to do it, but the wrinkles are going to smooth out for us. Wild Horses couldn’t drag me away!!! Finally have a chance to get on and read today’s comments. Angelica, thank you for your words. I agree with everything you have said. Being LDS and also a returned missionary, I can’t see anything wrong in posting the group pictures. Last, ray, please reconsider. You will be missed if you stay away, and Angelica is right. This is a time of adjustment for all of us, including David. I dropped in to chat for just a minute, but it’s been a long day and I really need to get some sleep. Sometimes I wish I could just stop time for a while and enjoy a bit more David time. Maybe things will slow down soon in my world. I love all the videos and pictures being posted. Thanks to all who bring them here. Good times!!! Yeah…good to see April gone! Happy belated Birthday to Betsy..hope it was happy. Angelica loved your stories of the missionaries! To hear that long time fans are leaving David for good is so sad….first, how do you stop being a fan of David??? I don’t know, but it sounds like they’re more a fan of being a fan. There is so much drama in the fandom, but one thing will never change for me no matter what..I will always be a fan of David, the person! That’s what we need to focus on…especially for the next two years! Thanks for chat last night, Abrra. 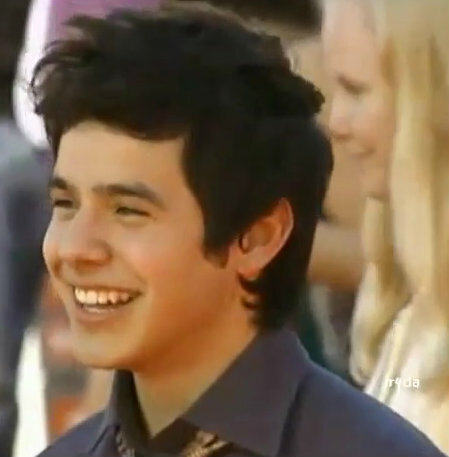 I had not watched the Idol performances for a long time–nice to be reminded how amazing David was on the show. I enjoyed chatting with everyone! Video of the day inspired by Gayle’s comment! Last night in Unplugged was balm for the soul! Thank you to everyone who came by to visit. We had some new faces which was wonderful. Xaris , it was so special that you came and chatted with us! Also, I want to mention that Ray came by and reaffirmed his commitment to David as a diehard fan! Haha. Ray how was it to be the Rooster in a house of hens? You fit right in there with us. I am thrilled that you came by! I am paying for the late night today. But it was worth it to have the chance to connect with everyone. Many said its the best therapy to get through this drought. I am doing what I can to make it fresh and interesting! pattinc, wordpress, I sometimes still have issues too, greer, but don’t give up, we’d miss your smile. abrra, can I just say, y.o.u.r.o.c.k. Abrra and all at the unplugged session – what a great time! Thank you! And all this fan drama will die down. It is hard on everyone knowing how to keep linked to David while still respecting his privacy. Each has to do what works for them. Even the missionaries can’t quite keep from commenting – who can blame them? So, I have talked about David’s green eyes a number of times. And others have seen his eyes look amber. I found a picture that shows exactly what I saw when i met himin Atlantic City and thought I’d landed in The Emerald City. Take a gander at those gorgeous eyes! I had so many ideas to go to Chile, but last night promised to all people in the chat, do not cross the Andes. I hired a helicopter and take a quick course in skydiving. I wanted to fall on the roofs of the temple. Very dangerous, I have fear of breaking something. Then I will not be able to climb up to escanario in 2014. (Canceled). Crossing the Andes in paragliding, but I have fear that the wind takes me to China or the middle of Africa. (canceled). -cleaning service, called one of his missionaries who found a mouse in the drawer, I can go? But I think that they will not believe me, when they see my face, (besides being a pretty face Latin) is going to realize my intentions. (canceled). But all these plans were in the past, I made a promise and I will fulfill. (Chile does not exist, Chile does not exist, Chile does not exist, Chile does not exist). Gladys– “Chile does not exist”–LOL! Our new mantra! And Marlie, those eyes in 128. Bee-yoo-ti-ful! What a gorgeous picture. My son has intensely blue eyes, and random strangers frequently compliment him which makes him blush beet red. David always handles the attention so well. He should give lessons on how to field compliments gracefully. Marlie, I did take a gander at those gorgeous eyes………..MESMERIZING!!!!!!! No denying David, you’re a hunk! Thank you all for making chat such a great time. It really does help. Marlie, Those eyes and the focus behind them are lethal. Xaris! You made it to chat! Blueberry!!! So nice to see your name in the thread. Miss you. Gladys, you are to funny jajaja. 129. Dear, dear Gladys — very wise decisions by you to cancel those Andes-crossing plans (aww, you remembered the paper-eating mouse, jajaja). Of course, we know that you, by your own admission, are continuing to train at the gym in order to be ready for your anticipated stage-climbing in 2014. We understand and we’re right behind you ….. well, at my age, maybe not literally. Such fun to have you in chat to share the David love. Sad I couldn’t be in chat last night. It was one of those days–a good one but busy and long. Hopefully, I’ll be there the next time. Now can we discuss those peepers please? I mean really.they have been ,amber,brown,black green,hazel depending on light, sunshine,darkness.what?so mysterious, and beautiful. Abrra, still thinking about what a great time was had in chat last night!! Thanks for the get together. what fun it was! someone that said it has been blown way out of proportions. I have not and I believe no one should call anyone a “bad fan” if u go searching for the missionary sites to find David. I am sure everyone is curious of what & how he is doing. These sites r done by a family member r someone close to the missionary & r meant for family & friends but most r public so gives u the right to view. What u choose to do with them well that is it up to u.
happy and not to search him out while on his mission. Last night’s chat was very therapeudic, lot’s of fun and good vids. Gladys…”there is no Chile”…I’m with you there…it’s so hard! Sky, I must be losing it too, that’s the way I feel watching that hug!♥ Goes right thru me!! I know this video has no relation to David, but I laughed a lot with one comment. Is a band that pays tribute to Queen, they are called Queenextravaganza, and lead singer Marc Martel is, they are Canadian. Canadian??? Repairing﻿ the error made sending us Justin Bieber? New update from Patti! Go leave some love. Abrra, I clicked on that tumbler page an hour ago. Time certainly does fly when you’re having fun. 🙂 Thanks! That keeper is bookmarked! Speaking of fun and time flying, chat with you guys was like chicken soup for the soul last night. I so enjoyed watching those old performances from AI with everyone, remembering where it all began and why. Abrra that is the largest tumblr page I’ve ever seen. It’s gotta be a full time job keeping that up. Had a really enjoyable time last night in The Voice Unplugged! We had a full house! I probably stayed up too late (even for me!) but it was just the place I wanted to be. JR joined us later on in the night/morning. It was good to see her in real time to thank her for all she does for the fanbase. Tawna, We missed you last night! Next time! Regarding the hug gif in comment #132! I actually felt the hug, like a transfer of energy. Yowsa! Ray, I agree that tweet to me, also, came off as a bit like we as fans should be ashame to want to see a picture of David during the two year hiatus….and yes,he did do a lot before he left, but it was for his benefit as well…..I will always be here to support David’s career, inspite of what is going on in his personal life. Hey All. Loving all the DA goings on. I don’t get too excited or bent out of shape with either of the positions on the David mission stuff because in my world there are too many other very serious issues that require my attention. Have to see about getting my own life in order so will be lurking for the most part. 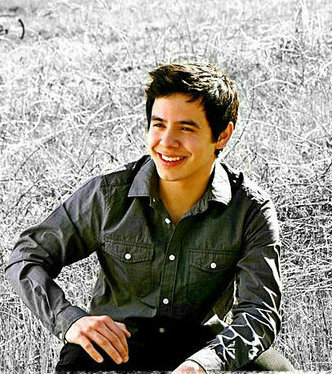 GUYS A FAVOR CAN U PLEASE VOTE GOTTA BE YOU ON MYX IT’S #2 IF WE COULD JUST BEAT DAVID ARCHULETA WITH HIS FOREVERMORE…. The Filipino fans say today is crucial for the weekly rank because 1D and David both were at #1 twice this week. You can create more email accounts if you’d like. Please vote! Ahhh! The face of joy! 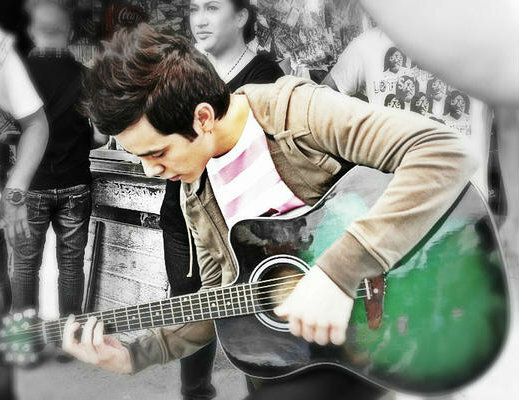 It soon may time to prepare for Nandito Ako viewing parties and to buy the DVD!! This from TDC via JR.
the Nandito Ako DVD w/ English subtitle will only come AFTER the series had its run in the US. The series should start anytime in the next 2 months I think. My hope is that the DVD sells well. I hope there is more interest in this since I have added the on demand feature. Djafan, you are doing way more than ok, you are doing a fantastic job. Thank you, thank you for all adm. hard work. 152.Dja ,ove when other musicians show David some love.So was this a David performance, or did he go see them perform? Nice tweet. account. Her commitment to David is never in question and she’s our link to his tweets and that is so appreciated. Nothing has changed. As a fan I will continue to appreciate David for how his music makes me feel. I know that my intentions are pure and that wanting to see pictures of him isn’t a show of disrespect. My heart is in the right place as is your’s ; it’s all good. David is almost at one million followers! Can you believe it? He’s picking up more followers now that ever before and he’s not even here! 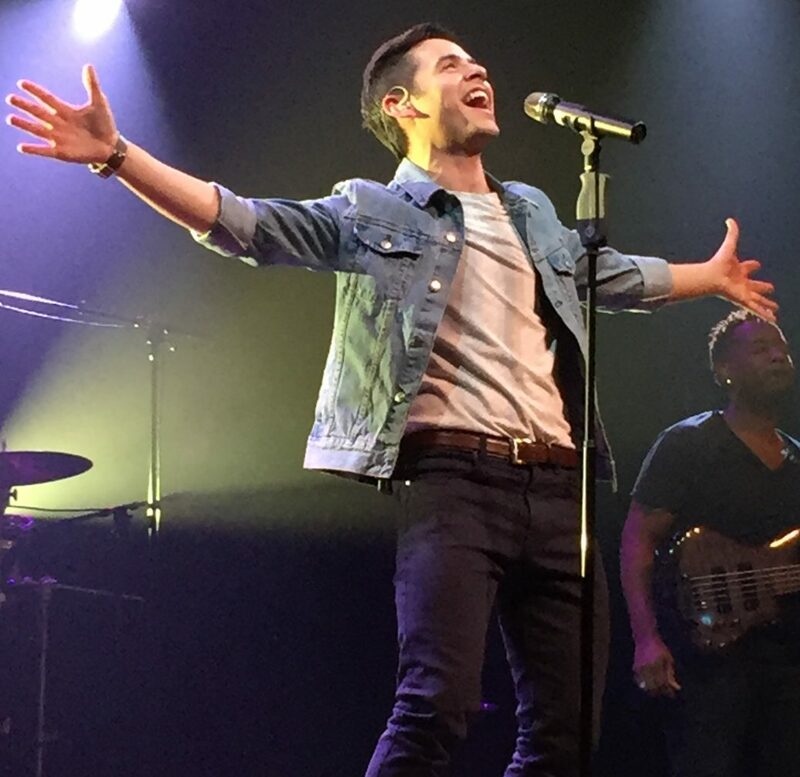 Congrats to David and his fans for reaching 1,000,000 twitter followers! Yay for 1M followers! and it was WWTT this morning. Also, did David/Kari change David’s Avi? Oh, and PS – YEAH!!!!! for one million followers! marlie, well said in regards to Kari’s tweet. Lol, “We’ll probably still sneak peeks at missionary blogs, hope for a photo glimpse of our sweet David, and get in trouble again”.